Ralph Baer, "father of video games" and one of the cornerstones of the early video game industry, has died at 92 on December 6, 2014. 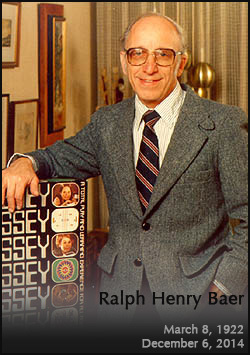 In 1966, Ralph H. Baer came up with the concept of a "television gaming apparatus." This device included both a chase game and a video tennis game and could be attached to a normal television set. There were about 40 million TV sets in the U.S. homes alone in 1966, to say nothing of many more millions of TV sets in the rest of the world. They were literally begging to be used for something other than watching commercial television broadcasts! On January 27, 2016 we celebrated the seventh birthday of the Pong Museum. We have had a wonderful start and were able to collect many fascinating Pong systems in the last years. The museum is promoted on many websites - among them switched.com, boingboing.net, retromagazine.eu and MoOM. We had a nice chat with Jamillah Knowles from BBC Radio on air in the UK. Mr. Ralph H. Baer, inventor of Home Video Games and the Odyssey, signed our museums Odyssey 200 in Berlin on July 29, 2009. Also, our Pong Clock # 283 has been signed by the designer Sander Mulder. The museum is officially opened since January 27, 2009 to commemorate the 40th anniversary of video ping-pong and the birthday of the Magnavox Odyssey 37 years ago. Any information, input, contributions or anything related to Pong systems will be greatly appreciated - please contact us. Have a look to our Golden Book. Klicken Sie hier für die deutsche Version. 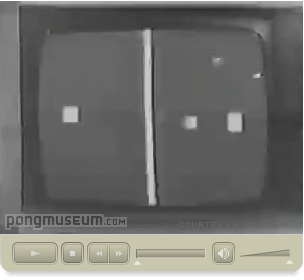 this may be the 37th birthday of the Magnavox Odyssey game but it's also the 40th birthday of the video ping-pong. It might be nice if you included the short video of Bill Harrison and me playing ping-pong back in 1969, which I am attaching. By early 1967, Ralph H. Baer had drafted Bill Harrison, a bright and capable Sanders technician, into the new project as his chief hardware guru. Harrison had loyalty and respect for Baer's knowledge and experience, and the two quickly found that they worked well together. With the idea of TV games burning in his imagination, Baer wasted no time to put his vision into practice. It took several years and numerous false starts, but in 1970, Baer showed the game to Magnavox, which signed a licensing agreement the following year. Then, on January 27, 1972, Magnavox launched Baer's "Brown Box" technology as the Odyssey video game console - the world's first home video game system. Priced at $100, the Odyssey utilized simple black-and-white graphics, and enhanced by plastic overlays for the television screen. Read more about the beginnings of video gaming industry at the History section. Also in 1972, inspired by an early peek at Baer's original video tennis game, Nolan Bushnell and his Atari company released an electronic arcade game called PONG, which became a huge success. In September 1972, a prototype was tested on top of a barrel as the first commercial coin-operated machine in a tavern in Sunnyvale, CA, called "Andy Capp's.". The video game revolution had begun... From 1972 through 1976, you couldn't go to a pub or arcade without finding a long line at the PONG machine. Pong™is a registered trademark of Atari Interactive registered in the U.S.A. and other countries. This Website is in no way endorsed by Atari Interactive. All trademarks mentioned on these pages belong to their respective owners (if they still exist). pongmuseum.com is not responsible for Links outsite this Website. The owner of the linked Website are responsible at their own. The creator of this site is not related to the content of their site. You enter this site at your own risk, the creator of the page is not responsible of any damage.